Born in Genova, Italy, in 1948, I started teaching myself how to build period musical instruments out of sheer passion and curiosity in 1979. Later on I took formal apprenticeship in the shop of the Genoese master luthier De Vincenzi. 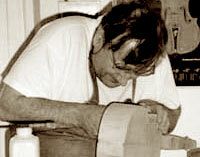 In 1982 I was one of the Founding Members of the Genoese Artistic Luthiery Society. For years I have specialized in replicas of baroque bowed instruments, of the Viola da Gamba family in particular, but also baroque violin and cello. Besides these philological reproductions, for which I'm aided by bibliographic and artistic researches and by consulting many professional musicians and experts in this field, I also perform baroque reconversion of original baroque instruments which have been modified in the course of the years, restoring them to their original aesthetic and functional features. 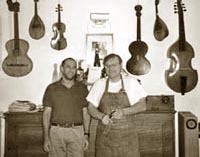 In 1996 I was admitted to the Italian Professional Luthiers and Bow-makers Group. "Gruppo Liutai ed Archettai Professionisti Italiani". My instruments are played by numerous musicians, both in Italy and abroad (Austria, Belgium, Germany, Holland, and Japan). Some of my instruments were ordered and purchased by the Conservatories of Wien and Leipzig. 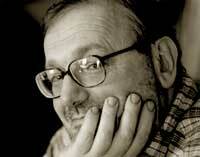 Recently I built a set of gambas for the ESMUC class of Master Savall in Barcelona. October 29 through December 15, 1982 "Genoese Luthiery Exhibition", Saint Augustin Museum, organized by the town of Genova. December 6 - 7, 1987 "Ligurian Luthiery Exhibition", Council Hall, Savona Town Hall, organized by the town of Savona. In September 1992 I participated in the "International Exposition Citta` di Bagnacavallo", winning Second Special Prize in the viola section and Third Prize in the double bass section. November 1993, Luthiery Exhibition, Villa Groppallo, Vado Ligure (SV). November 1997, 1998 and 1999, Exposition of the Italian Professional Luthiers and Bow-makers Association, Science and Technique Museum, Tokyo, Japan. May 2000 Exposition in Beijin.